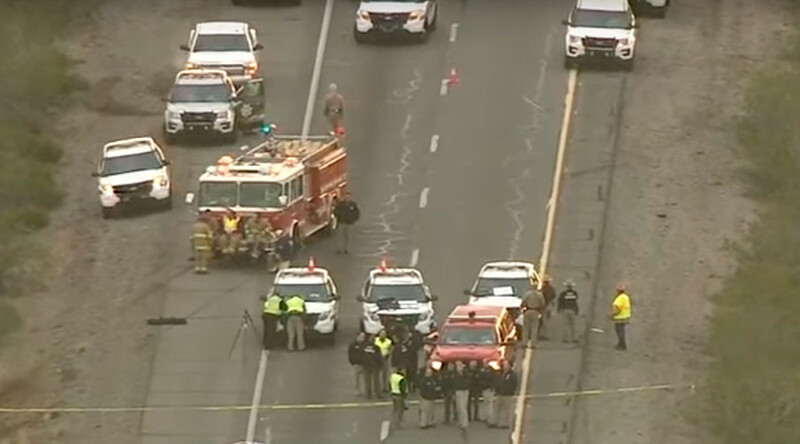 An unknown motorist is being hailed as a hero after he shot and killed a suspect who had ambushed an Arizona state trooper on Interstate 10, west of Phoenix. The trooper had been investigating a car crash when he was shot and rushed by the attacker. The trooper, identified only as a 27-year veteran of the force, was responding to a call about someone shooting at cars on I-10 at around 4:30am local time, Department of Public Safety Director Colonel Frank Milstead told local media. At milepost 89, the trooper found a car that had rolled over and sought to help the female passenger who had been injured. While in the process of setting up flares, he was shot in the right shoulder. The shooter then charged the trooper, overpowered him and started slamming his head into the pavement. It was at this point that an “uninvolved third party” pulled over and asked if the officer needed assistance. “Please help me!” the trooper said, according to Milstead. The man returned to his vehicle, retrieved a personal weapon, ordered the suspect to stop, then shot him. "I don’t know if my trooper would not be alive without his assistance," Milstead told KPHO. The suspect died of his wounds. The woman who was injured in the car crash died from her injuries. The trooper is recovering at an area hospital. The Arizona Department of Public Safety has not released any of the names of the people involved, including the armed citizen. A stretch of I-10 near Tonopah, Arizona was closed off as part of the investigation, with traffic headed to California rerouted for several hours on Thursday morning.